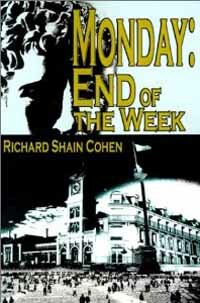 I wanted to let you know about my novel, Monday:End of the Week. It has recently been re-released in an e-book format. Below is a review and the synopsis. This intriguing novel (that looks into the lives of some very complex people) begins in the 1930’s in New England. The author doesn’t spend a lot of time in the first chapter describing the characters or the setting, but instead in a few opening paragraphs, he pulls you in, holds your attention and doesn’t let you go until the very last sentence and then you are sorry that it has ended. I found ‘Monday’ engrossing, entertaining and thoroughly enjoyable. Monday, day of deception, conspiracy, cowardice, self-indulgence; day of kindness, love, courage during early and mid twentieth century anti-lesbianism, glass-ceiling norms. Marion deserts her fiancé, Warren, and elopes to France with the artist Giselle. Returning to Warren, she meets Jocelyn, a celebrated singer, and the wife of Aaron Lobel, a physician. Aaron has established a clinic for the poor, anathema to the Massachusetts Medical Society of that day. He courageously combats his opposition while his wife resolutely continues with her career. Marion becomes a college professor. The Lobel son Jeremie comes to teach at the college. He and Marion become links for the contrast between the Lobel and Worfield families. The deceitful college president, Edmond Worfield, and his wife, Lisa, desire an exemplary family, as their frustrated and disappointing sons, Nelson and Conrad, compete over the Worfield’s ward, Frances, they prevent the Worfields’ wished for fulfillment. Within this turmoil, Marion succeeds and Jeremie learns the secret of his parents’ turbulent relationship. End of the Week shows that courage, endurance, and love triumph over cowardice, conspiracy, and degeneracy, that these intertwined persons sustain or destroy themselves by self-indulgence or commitment to social benefit.